Discussion in 'Guitars' started by uwmcscott, Sep 1, 2017. So I got an email that Musician's Friend was "unveiling" some 2018 gibbys. This one caught my eye....comes in a gold top and all black too. Regular nut, no robotuners, no funky inlays or holograms, Gibson P90's....what more could you want? Horax, kungphugrip, stevebway and 2 others like this. A Classic (thin neck) with P90's. Horax and stevebway like this. Horax, Rokdog, stevebway and 1 other person like this. I'll take one in ebony. Buy the same guitar with the same specs made by Edwards. It's cheaper, and in my opinion better quality. I recently purchased a lefty gold-top P90 Edwards LP for around $699 that was spectacular. It made my Agile GT look pretty green in color when you compare them. Horax and peskypesky like this. Gibson posted this picture on Facebook a few days ago. A beautiful pic of a beautiful guitar. Niko Souza and peskypesky like this. Yep, there are certainly less expensive options. And remember too that MSRP/advertised retail with Gibson/PRS/others is not usually what you pay. I'm a fan of the full gloss finish and binding/etc that you get on the standard/trad/classic, but the tributes are a definitely a true LP at heart. I'm just happy to see them going back to standard specs and having a P90s offering in the top line USA models. the tributes are a definitely a true LP at heart. Now, I love the look of that FretKing. And I'm guessing it's a nicely made guitar....maybe in some ways as nicely-crafted as the MIA Gibson....but still, knowing the difference in labor costs, and knowing the Gibson is made with better quality components....It would be hard for me to choose the FretKing over that Gibson. stevebway, PsychoCid and andrewsrea like this. Definitely like those. But since I've got all the P-90s I can want currently, $2K is too much for me to get GASsy. Hot damn! That blue one really turns my crank. Pity about the slim taper neck though. I couldn't afford this regardless though, so I'll stick with my Tokai gold top I suppose. tobijohn and PsychoCid like this. 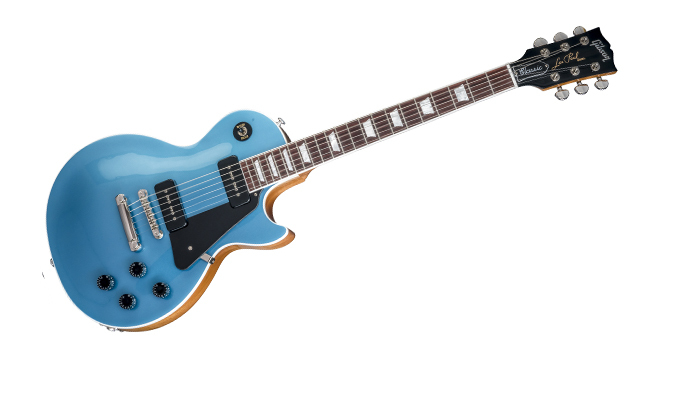 i will say this is my favorite blue Les Paul! thats proper! It doesn't matter anyway... I don't think I'll ever spend more than a thousand dollars on a guitar again... And even $1K is a stretch.